it’s been almost two years since i posted about wii fit, but i’ve been playing its successor, wii fit plus weekly for more than six months now and have 4-star ranked the majority of the new balance activities, so am going to be setting it aside for now. the game turned out to be more worthwhile than you might expect given the similarities of the titles. along with some streamlining (you can now create your own custom workout by putting exercises and activities in a sequence with no breaks in between) which i didn’t bother spending much time with, the game includes a surprisingly rich range of new balance mini-games: 12 are brand new and three are harder versions of mini-games from the original edition. 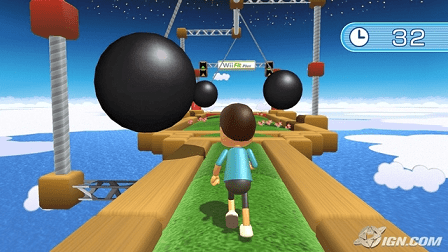 there’s a lot of variety in the new mini-games, and more than that the good folks at nintendo (bless ’em) as usual didn’t just churn out a second money-maker with trivial additions, but added a new emphasis to this iteration: the new mini-games purposely try to make use of both the wii remote and the balance board, in an effort to stimulate the brain as well as the body. for the most part this works extremely well, and i appreciated how the new mini-games had a different feel. as with the original, spending hours trying to get the top rank in a mini-game is much more worthwhile when you have the added side effect of getting some exercise (although the amount it actually qualifies as “exercise” is no doubt still debatable). i was certainly more there for the games than the exercise, so i didn’t focus much on the yoga or strength-training activities (which are pretty much all the same from the original anyway), but i dipped into them fairly regularly and the lure of trying to get a 4-star rank was almost as strong as with the balance mini-games. other than the new mini-games and some added info such as estimates of the intensity of each activity and the number of calories burned there wasn’t much new in terms of presentation or features, but as an expanded edition of the original this was much more essential than i expected and certainly worth putting some time into it. oddly enough, this game hasn’t been made completely obsolete by its successor, wii fit u for wii u due to that game removing a significant number of activities from the first two games. it’s not clear why nintendo choose to do so, but in any case i’m sure i’ll be revisiting this game to nab a few more of those 4-star ranks… eventually! ← polished mighty flip champs!